Hav-A-Tampa Jewels Cigars, are high-quality machine-made cigars, skillfully crafted using premium Dominican and Honduran tobaccos. The natural wrappers used for the Hav-A-Tampa Jewels produce a smoke that’s smooth and mellow with a lightly sweetened flavor to the taste. Each Jewel is fastened with a Birchwood filtered tip providing a woody note essence to the smoke. 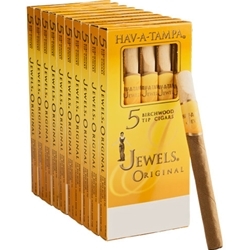 Over 50 years ago, Hav-A-Tampa's master cigar-makers cured, blended and rolled a special mixture of fine tobaccos and created a mild and aromatic cigar called, the "Jewels". Hav-A-Tampa's were amongst the first premium quality cigars in the industry to use a wood tip. These cigars are made by combining fine Dominican and Honduran tobacco, giving them a subtle sweetness and the authentic tobacco aroma. Tr Hav-A-Tampa Jewels Cigars today here at Smokers Discounts.